Last Sunday, Coyo, Jeanine, Mishe, and I set off for an afternoon at the “Blue Hole” pictured at the tail end of my last post. As you could see, “The Blue Hole” is just lovely and now you know it’s located in Sycamore Canyon, which is a deep, remote gorge formed by Sycamore Creek at the edge of the Colorado Plateau in Northern Arizona. Rumor has it that Geronimo used this canyon from time to time to hide his whereabouts from those in pursuit. The rim of the canyon is over 6,000 ft and the creek bed is well over 2,000 feet below. Only pedestrian and equine traffic are allowed in the canyon itself and the trailheads are only accessible by dirt or gravel fire roads. Fortunately one of these trailheads is only about 10 miles from my massage school and The Blue Hole is just a few miles hike from there. Since the temps these days are reaching into the low 100’s without even trying, the many large trees and various swimming holes along the way kept us cool as we made our way up canyon. This is Jeanine and Coyo at one of the swimming holes along the trail. It was so hot, we had to stop and cool off. The creek you see behind them is fed by natural springs located a short distance away. Pretty lush for a desert, huh? That’s because it’s a fairly rare Riparian Forest. 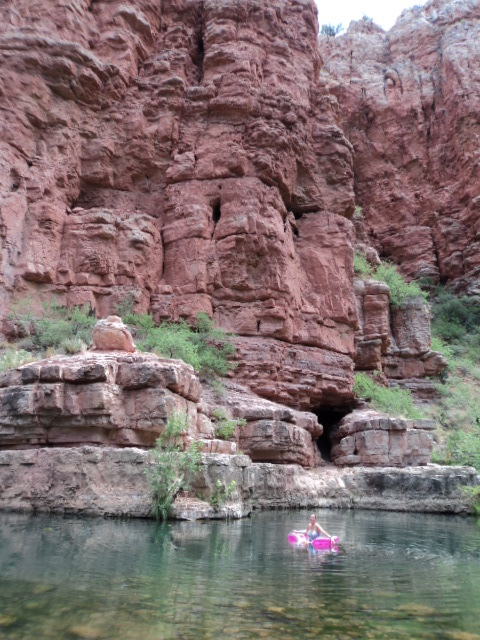 And here I am on my pink raft at The Blue Hole. It makes me laugh because a cactus thorn bit my raft on the way in so it had a slow leak and by the end of our time at the creek, it became more of a drowning hazard than a flotation device. And here is Mishe catching a ride out of the canyon. He hiked all the way in on his own, but by the afternoon, the sand was so hot he was happy to have a lift to keep from burning is feet. What fun for me too! 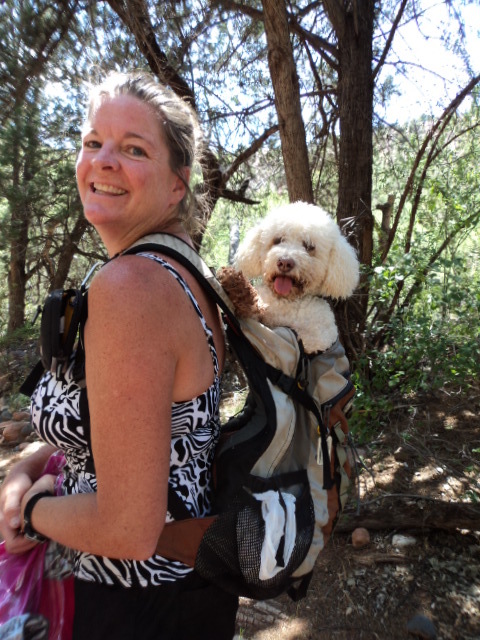 I loved having a dog I could put in my backpack. Perhaps my next dog will be a “pocket dog” of some sort. That’s it from Sycamore Canyon. Today, I’m off to study at the pool and later on will set up my little chair massage business, Relaxation Station, at the Concert In The Park in Clarkdale. I think tonight is Rhythm and Blues. ← 4th of July in Alaska! That looks like so much fun!! I especially love the pocket dog. 🙂 I’ll be calling ya soon! Looks like my kind of place. I don’t run around in my bikini much here, only during a blue moon. Love the dog photo. There’s something to be said for those little ones. Keep having fun and keep posting. Miss you. !